Stretch for clarinet, bassoon, trumpet, trombone, violin, double bass, percussion (one player); (work in progress); for the Octandre Ensemble, to be premiered by them, 2019-20. Shroud (dream-piece 16.viii.18) for solo soprano, woven fabrics and electronics (work in progress) (14′). On Tranquility for clarinet, accordion and intermodulating sine-tones (work in progress) (13′); for Heather Roche and Eva Zöllner. Iron rain (dream-piece 18.vii.18) for electric guitar, aluphone (or bells) and piano (12′); for Ensemble Offspring, to be premiered by them, Paddington Town Hall, Sydney, Australia, 21 June 2019. Mendeleev’s Dream for children’s voices and sine-tones, with optional SATB choir and audience participation (3′); commissioned by St Catharine’s College Cambridge to celebrate the 150th anniversary of Mendeleev’s formulation of the periodic table; premiered by the Girl’s Choir of St Catharine’s College, Cambridge, 21 March 2019. The text is made up of the names of some of the elements from the periodic table. A version of the work divided into eight sections, each with a spoken introduction, can be heard here. In the shape of a rose (2017-18) for cello and tape (9′); may also be performed with readings from Ian Duhig’s ‘Seven Leaves in the Shape of a Rose’; premiered by Ian Duhig and Anton Lukoszevieze, Ilkley Literature Festival, 6 October 2018. Les Doigts du Soleil (2016-18) for theorbo, with or without instrumental consort (Baroque flute, Baroque oboe, natural horn in G, natural trumpet in D, two Baroque violins, viola da gamba) (solo version, 8-15′; with consort, 15-18′); commissioned by Caroline Delume, premiered by her with students of the Conservatoire de Versailles, Conservatoire de Paris, 21 December 2018. Five characters in search of a form (2017-18) for pianist and film (12′); commissioned by Zubin Kanga with funds from Arts Council England; premiered by him, Huddersfield Contemporary Music Festival, 17 November 2018; a film of that performance can be seen here. The calm of mountains (2017-18) for solo piano (14′); written for Florian Steininger, dedicated to the memory of Horațiu Rădulescu; premiered by Florian Steininger, Karlsruhe, 19 December 2018.
suo tormento was commissioned by EXAUDI as part of their Italian Madrigal book project and premiered by them, Wigmore Hall, 6 November 2013. The Italian texts are by Dante (Inferno and Rime petrose) and Gramsci (Quaderni del carcere), each Gramsci text in some way a commentary on Dante writings. This is the wind (2017-18) for violin, cello and piano (16′); commissioned by the Fidelio Trio; premiered by them, Spitalfields Music Festival, London, 8 December 2018. The title comes from James Fenton’s poem, ‘Wind’: ‘This is the wind, the wind in a field of corn’. The four movements may also be played separately. O Antiphons (2004-18) for SATB choir. Seven anthems for Advent, setting Latin and Early English texts; dedicated to Lisa Colton and Edward Wickham. 1. Alpha and O (2017) (3′). Text: ‘O Sapientia’. Written for the Choir of St Catharine’s College, Cambridge. 2. In a flame of fire (2017) (2’30”). Text: ‘O Adonai’. Written for the Choir of St Catharine’s College, Cambridge; premiered by them in the Chapel of St Catharine’s College, 30 November 2017. 3. Our grace (2016) (2′). Text: ‘O radix Jesse’. Written for the Choir of St Catharine’s College, Cambridge; premiered by them in the Chapel of St Catharine’s College, 27 November 2016. 4. Open the gate (2004) (2′). Text: ‘O clavis David’. Commissioned by Winchester College; premiered by Winchester College Chapel Choir, December 2004. Recording by EXAUDI on NMC D114. 5. Morning star (2017) (3′). Text: ‘O Oriens’. Written for the Choir of St Catharine’s College, Cambridge; premiered by them in the Chapel of St Catharine’s College, 30 November 2017. 6. A cornerstone (2017) (3′). Text: ‘O Rex gentium’. Written for the Choir of St Catharine’s College, Cambridge; premiered by them in the Chapel of St Catharine’s College, 30 November 2017. 7. Trust above all (2018) (3’30”). Text: ‘O Emmanuel’. Written for the Choir of St Catharine’s College, Cambridge. Planes and folds (2017-18) for solo violin and pre-recorded sine-tones (13′); for Yael Barolsky. Caoineadh (2017) for flute (doubling alto flute and piccolo), clarinet, piano, violin and cello (15′); commissioned by the London Ear Festival for the London Sinfonietta and premiered by them in the Warehouse, London, 22 March 2018. The piece is a memorial for Bob Gilmore (hence the Irish title, which in his accent would be pronounced ‘keener’) and alternates sections which evoke the shade of Claude Vivier, subject of much of Bob’s scholarship, with sections based on a repeated, falling, mourning figure. Jesu meines Herzens Freude (2017) for organ (4′); a prelude for William Whitehead’s Orgelbüchlein project, premiered by him in Lichfield Cathedral, 29 September 2017.
senza misura (2016-17) for solo piano with optional electronics; for Philip Thomas, to whom it is dedicated, premiered by him, November Music, Netherlands, 12 November 2017. The music is in 27 sections, with an optional coda, and a performance may consist of any or all of the numbered sections, in any order. His song (2017) for solo voice and prerecorded voices, or for four voices (3′); text by James Joyce (from Portrait of the Artist as a Young Man); for Leo Chadburn, premiered by him, Cafe OTO, London, 24 July 2017. This work is a re-arrangement of John Cage’s ‘Story’ from Living Room Music, substituting Joyce’s words for those of Gertrude Stein; both begin ‘once upon a time’. untouch-touch (2017) for percussionist, six gongs and live electronics; for Serge Vuille, premiered by him, Huddersfield Contemporary Music Festival, 22 November 2017. Flauto inverso (2016) for flute and pre-recorded sine-tones (15′); for Karin de Fleyt, premiered by her, Iklectik, London, 9 December 2017. When Karin recorded my alto flute solo stone.wind.rain.sun in 2015 we talked about ways of re-imagining the flute. For me this is somehow linked to the idea that when wind instruments came into European concert music they had a significance which we no longer hear, in the case of the flute because of Boehm’s re-design of the instrument. In Flauto inverso the sine-tone soundtrack measures out the internal acoustic space of the instrument with an inverted, and progressively compressed overtone spectrum. Untergrundnetz mit Sternenlicht (2015-16) for four electric guitars with e-bows (c.16′); for e – w e r k, premiered by them, Kunstquartier Bethanien Studio 1, Berlin, 9 November 2017. Premiered by the Brenda Faegre Edge Ensemble, Splendor, Amsterdam, 17 May 2017. Each movement has some sort of variable element: in ‘Gyroscope’, two of the players engage in competitive improvising; in ‘Spindrift’ timing is determined by a series of sustained actions – grinding, pouring, tearing, etc – performed by the percussionist. This music began in the summer of 2015 in a dream in which notated figures seemed to be moving vertically past collections of pitches – a sort of pinball score; that idea has survived, although in a more worked-out form, in ‘Reel’ and ‘The Wheel of Fortune’. She dreams, she dances (2016) for soprano and piano (22 minutes); for Elizabeth Hilliard and David Bremner, premiered by them in the Hugh Lane Gallery, Dublin, 4 February 2018; song-cycle to poems by W. B. Yeats. In the spring of 2016 I found myself quoting (misquoting, it turned out) Yeats: ‘I carry the sun in a golden bag, the moon in a silver cup.’ Almost immediately I realised that I wanted to set these words, and the rest of the poem from which they come, ‘Those Dancing Days are Gone’. It seems to me that Winterreise and Dichterliebe, cycles in which there is a continuous narrative with the singer as a protagonist, have far fewer successors than one might think. In She dreams, she dances I have tried to add a new song-cycle to the list, a sequence of songs in which the singer not only sings about, but also embodies, a woman confronting love, loss and the passage of time. Topophony (2016) for chamber orchestra (1.1.1.1-1.1.1-1.1.1.1.1) with or without one, two or three improvising soloists (12-20′); for Ilan Volkov and the Israel Contemporary Players, premiered by them, Tel Aviv, 7 January 2017. A version of my orchestra piece Topophony – same harmonic material, but in a new distribution. A Great Tree (2016) for girls’ voices (SA) and piano (c.3 minutes); words by Charles Darwin from The Origin of Species; commissioned for the Girls’ Choir of St Catharine’s College, Cambridge. Trostlieder in Widerwärtigkeit des Kriegs (2015) for voices (SSATTBB) (25′); texts by Martin Opitz (1597-1639); commissioned by EXAUDI, premiered by them, Wigmore Hall, 20 December 2015. Unlocking the grid (2015) for solo woodwind instrument and three channel playback (16’20”); homage to the work of Agnes Martin. Source material (2015) for voices (AATTBarB) and tape (third movement only) (17′); three movements, ‘Origins (d’après Rousseau)’, ‘The Descent of Language’ and ‘The Ascent of Song’, which may also be performed separately; texts by Edward Wickham and Jean-Jacques Rousseau; dedicated to Edward Wickham and Georgia Rodgers; commissioned by The Clerks with funds from the Wellcome Trust and premiered by them at the Wellcome Foundation, 27 September 2015. The first piece, ‘Origins’ sets Jean-Jacques Rousseau, speculating on the relationship between singing and speaking, a text which recurs in the final piece, ‘The Ascent of Song’; the second, ‘The Descent of Language’, is a collage of the everyday banalities – ‘whatever’, ‘sink or swim’, ‘every little helps’ – that we use as sentence-fillers; and the third grows out of short audio extracts from the great and not-so-great – Einstein, Edward VIII, Jackie Kennedy and Margaret Thatcher. Song (24.iii.1916) (2015) for voices (c.4′); commissioned by CoMA, premiered by the CoMA Singers, King’s Place, London, 5 March 2016. The Red Studio (2015) for piano for John Snijders (24′); premiered by him on BBC Radio 3 on 9 January 2016. John told me about the lost art of preluding, when pianists would improvise introductions to, and links between, the different works in a concert. I’ve written four very different sorts of music, each a sort of closed system, connected by preludes, interludes and postludes. 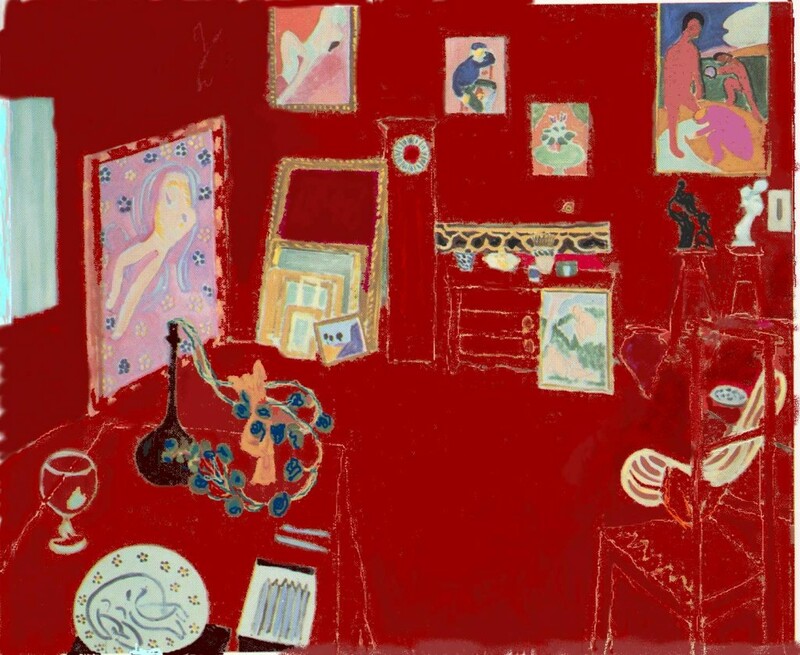 The result is like one of those paintings in which the artist depicts his own studio, as in Matisse’s painting, The Red Studio. The BBC made a short film about the piece at the time of the recording. Phantom Voices (2014) for six voices (AATTBarB) and electronics (60′); texts by Edward Wickham; commissioned by The Clerks with funds from the Wellcome Trust and premiered by them, Festival of Ideas, Cambridge, 31 October 2014. Sea to the west (2014) for solo soprano with electronics (10′); a setting of Norman Nicholson‘s eponymous poem about the Cumbrian coast, for Elizabeth Hilliard who premiered it in the Kevin Barry Room, National Concert Hall, Dublin, 6 June 2014. The electronics emphasise wave-forms and the act of memory: there’s playback of short fragments of the soprano’s singing, and sine-tones. I’ve wanted to set the poem ever since I heard Nicholson read it, more than 30 years ago. You can find no sign of water. In the incandescent mantle of the air. re:play for solo cello with recording devices (16′); for Anton Lukoszevieze. Recording devices – wax cylinder, tape and disc, for example – are used to make real-time recordings during the performance. It’s a piece which unrolls its own history so that it begins ‘finished’ and then reveals its components – bowing patterns, bowing rhythms, double-stop combinations, left-hand positions – but it’s also a piece about trying to remember an idea; the recordings a reminder of that first thought which can’t quite be recaptured. There’s a short BBC film about the piece. The Feeling of Remembering (2014) for any four woodwind and/or bowed string instruments; a solo piece to be played in five different configurations (total duration, c.20′); premiered by KNM Berlin (Rebecca Lenton – flute; Gudrun Reschke – oboe; Winfried Rager – clarinet; Theo Nabicht – bass clarinet) in simultaneous performances in the Schleicher/Lange and Barbara Thumm galleries, Berlin, 5 April 2014. Digitalis purpurea (2013) for toy piano; premiered by Xenia Pestova, London, March 2017. Early One Morning for two woodwind instruments (6’30”); for Eleri Ann Evans and Henri Bok; dedicated to them, and to the memory of Anthony Caro (1924-2013); premiere, Muziekgebouw, Amsterdam, 3 May 2014. Fountains of life, where the Lamb goes. Lodge in thy mystical, deep streams! And hatched all with his quickening love. The music grew out of a painting I saw in the National Museum of Art in Washington last August, The Marriage at Cana, by an artist known only as ‘The Master of the Spanish Kings’. Its nesting of different spaces, scales and styles and The Wedding at Cana (after the Master of the Spanish Kings) inspired a mash-up of modal dances in mean-tone tunings, the tunes based on the music played at weddings these days. The Dark Roads (2012-13). Two movements, which may also be performed separately: In the old style for keyboard tuned in sixth-tones and two sustaining string instruments; The Dark Road for solo viola or cello and sound-files (c.20′). Commissioned by Trio Scordatura; dedicated to them and to the memory of Horatiu Radulescu; premiere, Tate Britain, 5 April 2013. Tales from Babel (2013) for six voices (45′). Commissioned by The Clerks with funds from the Wellcome Trust, this is the prequel to the voice drama Roger go to yellow three which I wrote in 2011, taking the action back to the beginning of the world, language and humanity. Edward Wickham’s libretto connects the structure of the brain with the assembly of garden furniture. Most of the new scenes were premiered at the CMPCP conference in Cambridge on 5 April 2013; The Clerks gave the first complete performance at the Cheltenham Festival on 7 July 2013.
qui/nt/et (2012-13) for bass clarinet, trombone, electric guitar, cello and double bass (15-20′); commissioned by the Quiet Music Ensemble and premiered by them in the Aula Maxima, University College Cork, 21 February 2014. Susan’s Reel (2012) for two cellos, both with BACH.bogen (10′). Written for Oliver Coates and Anton Lukoszevieze; premiered by them, King’s Place, London, 11 June 2012.
chambre privée (2010-11) for string quartet (17′). Commissioned by the Bozzini Quartet; premiered by them, Chapelle historique du Bon-Pasteur, Montreal, 20 April 2012.
one/two/three/four-piece (2010-11) for one, two, three or four voices (12′). Commissioned by the Guildhall School of Music and Drama, with support from The Culture Capital Exchange; premiered by students of the Guildhall, Courtauld Gallery, London, 8 March 2012. Roger go to yellow three (2011) for 6 solo voices (AATTBB) (25′). Text by Edward Wickham. Commissioned by The Clerks with funds from the Wellcome Trust; premiered by them, Whipple Museum, Cambridge, 14 June 2011.
drift + drag (2009-10) for alto flute, clarinet, bass clarinet, horn, trumpet, trombone, tuba, percussion, electric organ, bass guitar, viola, cello, double bass (15′). Commissioned by KNM Berlin; premiered by them, Radialsystem V, Berlin, January 2011. Sing a new song (2010) for unison voices and SATB choir (2’30”). Commissioned by Faber Music for Sing Up. Natural Science (2009-10) for speaking violinist (or voice and violin/viola) (8′). Texts by Ian Duhig. Commissioned by Soundwaves Festival, Brighton; premiered by Darragh Morgan, Sallis Benney Theatre, Brighton, 18 July 2010.
as air, as light (2009-10) for solo guitar (14′). Written for Anders Førisdal; premiered by Dylan Lardelli, Michael Lett Gallery, Auckland, New Zealand, 10 March 2012.
schwarz-weiss (2008-10) for between three and nine musicians (9-15′). Written for Ensemble Klang and Trio Scordatura; premiered by Ensemble Klang, Smart Project Space, Amsterdam, 31 May 2012.
something to do with belief (2008-10) for clarinet, piano, electric guitar, percussion, cello (24′). Commissioned by the Transit Festival; premiered by Apartment House, Leuven, October 2010. Lines of desire (2009) for alto flute, clarinet, piano, percussion, violin, viola, cello (2′). Commissioned by ensemble recherche; premiered by them, 25 January 2011, Ultraschall Festival, Berlin (Radialsystem V). Extended play (2008-9) for flute, clarinet, trombone, piano, percussion, electric guitar, violin, viola, cello, double bass (17′). Commissioned by the Crash Ensemble; premiered by them, Henrietta Street, Dublin, December 11 2009.
for six (or multiples of six) wind instruments and electric guitar with e-bow (15-20′). Commissioned by Kammerensemble Neue Musik Berlin; premiered by them, Dyanamowerk, Siemens Berlin, June 20 2009. A study in daylight (2008-9) for oboe, horn, trumpet, harp, cello (5′). Commissioned by the Endymion Ensemble; premiered by them, Kings Place, London, June 3 2009; recorded on NMC D160. The work is dedicated to Virginia Black and the late Howard Davis. Headlong (2007-9) for solo woodwind and square-wave sound files (10’30”). Commissioned by Christopher Redgate; premiered by him, Dartmouth College, USA, May 5 2009. Too Far (2006-14) for soprano, violin, cello and piano (c.65′). Partial premiere (six movements marked *) by Kürbis, The Warehouse, London, 28 November 2008. Remaining movements commissioned by Musicon, Durham University. Complete premiere by Marijje van Straalen and the Ives Ensemble, Durham, 30 November 2014.
comme ses paroles (2006-8) for eight amplified solo voices, pre-recorded voices and amplified cello (70′). Commissioned by the BBC and Huddersfield Contemporary Music Festival; premiered by EXAUDI and Anton Lukoszevieze, November 22 2008, Huddersfield Contemporary Music Festival. hearing not thinking (2006-8) (15′). Made up of two sets of material: the erosion of memory for woodwind instrument, trombone, accordion (all amplified); and at the edge of time for bass drum, prepared piano, guitar, bowed string instrument (all amplified). Any or all of these two sets of independent instrumental parts may be combined; the title of any performance is taken from whichever set contributes the most parts, or the overall title is used if both sets are equally represented. Commissioned by ensemble Integrales; premiere by them (alto saxophone, prepared piano, bass drum, violin), Bregenz Festival, 4 August 2007; premiere by Apartment House (clarinet, accordion, bass drum, cello), Wien Modern, 11 November 2007.
schwebende Zeit (2005-6) for clarinet, electric guitar, viola, cello (18’). Commissioned by Ensemble KORE; premiered by Ensemble KORE, Chapelle historique du Bon-Pasteur, Montreal, 11 May 2007. 1-2-3 (2005-6) for string quartet (15’). Commissioned by the Smith Quartet with funds from Huddersfield Contemporary Music Festival and Arts Council England; premiered by the Smith Quartet, Huddersfield Contemporary Music Festival, 26 November 2006. Preluding (2005-6) for 8 solo voices (SSAATTBB) (8′). Text: William Wordsworth, ‘Was it for this’. Commissioned by EXAUDI; premiered by them, Greyfriars Kirk, Edinburgh, 28 November 2007. Dedicated to James Weeks and to the memory of Michael Tippett. The quality of the recorded sound is the only disappointing feature of this recording of the premiere; the performers are directed to sing ‘like a gale’. Susan’s Purple (2005) for solo cello (7′). Commissioned by Queens’ College, Cambridge; premiered by Anton Lukoszevieze, Queens’ College, Cambridge, 18 March 2006. Dedicated to Susan McNally. First Principles (2005) for voice(s) with(out) instrument(s) (12′). Commissioned by Queens’ College, Cambridge; premiered by Queens’ College Choir, Cambridge, 18 March 2006. Dedicated to Susan McNally. Iridescence (2005) for solo violin (4′). Commissioned by Queens’ College, Cambridge; premiered by Farran Scott, Cambridge, 18 March 2006. Chromascope (2005) four or more instruments (c.9-12′). Commissioned by Queens’ College, Cambridge; premiered by members of the College, Cambridge, 18 March 2006.
de Grote Muziek (2004-5) for flute, 3 saxophones, horn, 3 trumpets, 2 trombones, bass trombone, piano, bass guitar (12′). Commissioned by Orkest de Volharding; premiered by them in the Corzo Theatre, den Haag, Netherlands, 24 February 2006. Commissioned by the Ives Ensemble; premiere of Thermogenesis and A slice through translucence, Huddersfield Contemporary Music Festival, November 2005; first complete performance, Eindhoven 22 April 2007. She’s texting. He’s dancing. (2004) for three melody instruments, voice (optional), keyboard and wood-block (5′). Text: Ian McMillan. Commissioned by COMA (Contemporary Musicmaking for Amateurs); premiered by members of COMA at the COMA Summer School, July 2005. A Spousal Verse (2004) for six voices (AATTBB) (4′). Text: Edmund Spenser. Written for the Clerks’ Group and premiered by them in the Temple Church, London, 17 February 2005. Partition (2004) for three male voices and three electric guitars (8′). Commissioned by the Feedback Festival, Amsterdam. Premiered Paradiso, Amsterdam on 10 October 2004. The singers intone the names of the victims of Israeli and Palestinian terrorist attacks. Dedicated to the memory of Edward Said. 7 Serious Pieces (2000-7) for flute, violin, accordion, piano. Written for MKO Pozon sentimentál. Arc for solo violin (also version for solo cello with BACH-Bogen) (5′). A brief musical tribute to Harold Pinter, after the manner of his later work for four performers with portable instruments, accompanying solo musician and prerecorded soundtrack (7′). Premiered by Joanna Bailie, Laurence Crane, Christopher Fox and Cecilia Wee, with Anton Lukoszevieze, Bethnal Green Working Men’s Club, 6 February 2007. Rendered Account (2003) for six voices (AATTBB) (5′). Text: Ian Duhig. Commissioned by Edward Wickham and the Clerks’ Group with funds from the Ralph Vaughan Williams Trust and Arts Council England; premiered by them on Sunday 9 May, 2004 in St Nicolas’ Church, Newbury, as part of the Newbury Spring Festival. Recording by EXAUDI on NMC D114. Republican Bagatelles (2000-3) for solo piano (23’). Commissioned by Philip Thomas with funds from Arts Council England and premiered by him in the Firth Hall, Sheffield on 24 February, 2004. ZONE (Zeit-Ort-Name)(2002-4) for clarinet, trombone, tuba, accordion. electric guitar, violin, viola, cello, double bass and pre-recorded electronic tones (25′). Commissioned by the BBC for Apartment House; premiered by them in a BBC Invitation Concert, Maida Vale, London on 25 September 2004. Dedicated to Apartment House and Andrew Kurowski. Komposition mit schwarz, rot und gelb (2002-3) for percussion, accordion, piano, cello (10′). Commissioned by the Dresdner Tage für Zeitgenössische Musik. Premiered by members of Apartment House and Ensemble SurPlus in the Festspielhaus, Hellerau on 6 October 2003. Canonic Breaks (2002-3) for six percussionists (20′). Commissioned by the Slagwerkgroep den Haag and premiered by them on 26 November 2003 in Feliks Meritis, Amsterdam. Dedicated to Peter Adriaansz and Tom Johnson. Phonogrammatische Inventionen (2002) for solo percussionist (20′). Commissioned by Sender Freies Berlin for the Ultraschall Festival. Premiered by Christian Dierstein in the Sophiensaele, Berlin on 24 January 2003. Dedicated to Gerhard Stäbler and Kunsu Shim. Recorded by Arnold Marinissen on BVHAAST 2303. KK (2002) for alto saxophone and percussion (five cow-bells) (7′). Written for Nosferatu and premiered by them in The Warehouse, London on 19 September 2002. BLANK (2002) for three or more sustaining instruments of which at least two must be able to sustain sounds for up to 40 seconds (12′). Premiered by Apartment House in the Parkteatret, Oslo as part of the Ultima Festival, 11 October 2002. Dedicated to James Tenney. an der Schattengrenze (2001-2) for bass flute, bass clarinet, bass trombone, percussion, piano, viola, cello, double bass (20′). Commissioned by the Wittener Tage für Neue Kammermusik. Premiered by Apartment House in the Saalbau, Witten, 27 April 2002. Dedicated to Dieter and Maria Wellershoff. Shadow cast (2001) for 6 violins, 2 violas, 2 celli, double bass (14′). Commissioned by the Goldberg Ensemble with funds from the Granada Foundation. Premiered by the Goldberg Ensemble in the Royal Northern College of Music, Manchester, 17 February 2002. Strangers in our midst (1999-2001) for tenor saxophone, euphonium, accordion, banjo and cello, with surveillance video and playback (45′). Premiered by the VENI Ensemble in dieTheater/KonzertHaus, Vienna on 19th October 2001. Dedicated to Richard Ayres. Cello part may be performed as a solo work, inner. Generic Composition #5 for a sliding instrument (c. 6′). Recording by Anton Lukoszevieze on Metier MSV CD92059; also recording by Corrado Canonici with Generic Composition #8 on NMC D079. Generic Composition #7 for a keyed wind instrument (c. 7′). Recording by Kate Romano on Metier MSV CD92074. Generic Composition #8 for a variably sustained, just-intoned string instrument (10′). Recording by Corrado Canonici with Generic Composition #5 on NMC D079. Rules and Irregularities (1999-00) for organ (9′). Written for the Evenings of New Music, Bratislava, as a companion piece to the Prelude and Fugue in B minor (BWV544) of J.S. Bach. Premiered by in Bratislava Castle, May 2000. Dedicated to Tom Johnson. My First Century (1997-9) for clarinet/bass clarinet, trumpet, percussionist, piano, violin, double bass (13′). Written for Arraymusic and premiered by them in the Music Gallery, Toronto on 24 February 2000. Dedicated to Michael J. Baker. schwärme (1998-9) for solo piano (6′). Written for Ian Pace. Premiered by Ian Pace as part of the an Tasten Festival, Heilbronn on 26 September 1999. Dedicated to Ian Pace and Henrietta Brougham. skin (1998-9) for violin, viola, cello (19′). Written for Apartment House. Premiered by Apartment House in a BBC studio recording on 27 April 1999; first public performance, Apartment House, Conway Hall, London, 7 May 1999. Notes from a Cold Front (1996-8) for voice, recorder, lute, dulcimer (or equivalent instruments) (12′). Texts: anonymous 3rd century Latin fragments. Commissioned by Sirinu with funds from the Arts Council of England and premiered by them on 12 April 2000, National Centre for Early Music, York. Vanished Days (1995-8) for voice, piano (13′). Texts: Derek Jarman (from Modern Nature). Written for Anthony de Mare and premiered by him in the Donnell Library Center, New York on 16 February, 2001. Chant suspendu (1997-8) for solo cello, with or without piano (or tape) (10′). Written for Friedrich Gauwerky and Anton Lukoszevieze. Premiered by Judith Mitchell (cello) and Ian Pace (piano) in the Music School, University of Durham on 23 January 1999. Recording by Anton Lukoszevieze on Metier MSV CD92059. Liquid Architecture (1998) for sustaining keyboard, or 24 autonomous sound producing devices (at least 24′). Written for Huub ten Hacken and premiered by him in the Domkerk, Utrecht on 4 September 1999. The Art of Concealment (1997-8) for four percussionists (8′). Written for Ensemble Bash and premiered by them in Christ’s Church, Spitalfields, London as part of the Spitalfields Festival on 16 June, 1998.
how time passes (1997/1998) solo baroque violin (or hardanger fiddle, or violin) (8′). Written for Mary Oliver in a version for hardanger fiddle and premiered by her at the Huis an de Werf, Utrecht on 1 February, 1998. Revised version for baroque violin premiered by Mieko Kanno, Conway Hall, London, 7 May 1999. Dedicated to Mary Oliver. Prime Site (1997) for solo piano (22′). Commissioned by Ian Pace with funds from the Yorkshire and Humberside Arts Board andpremiered by him in the King’s Hall, Newcastle University on 13 March 1997. Recording by Ian Pace on Metier, MSV CD92022. Pastoral (1996) for flute and piano (10′). Written for London New Music and premiered by Ann la Berge and Michael Blake in St Giles Cripplegate, London on 24 May 1996. Dedicated to Patrick Eyres. Complementary Forms (1996) for solo piano (3-5′). Written as a 50th birthday present for Michael Finnissy and first performed by Ian Pace in the British Music Information Centre, London as part of his Finnissy Birthday Concert on 11 July 1996. Recording by Ian Pace on Metier, MSV CD92022. Themes and Variations (1992-6) for flute, clarinet, bassoon, trumpet, piano, percussion, violin, viola, cello, double bass (40′). Written for the Ives Ensemble and premiered by them in de IJsbreker, Amsterdam on February 29, 1996. The title is taken from John Cage’s book of the same name. Dedicated to the Ives Ensemble. Recording by the Ives Ensemble on Metier, MSV CD981. Oboe Quintet (1995) for oboe, 2 violins, viola, cello (15′). Commissioned by the British Music Society of York for their 75th anniversary concert season with funds from the Yorkshire and Humberside Arts Board, City of York Council, the Holst Foundation and the British Music Society ; premiered by the Brindisi Quartet with Melinda Maxwell (oboe) in the Lyons Concert Hall, York University on 16 February 1996. Dedicated to my parents. Recording by Chris Redgate and the Kreutzer Quartet on Metier, MSV28513. Paired Off (1995) for solo piano (4′). Written for Daniel Matej’s Satie project as one of 25 pieces based on Satie’s Trois Morceaux en forme de poire and premiered by John Tilbury in the Evenings of New Music, Bratislava, 11 June 1995. Dedicated to Daniel Matej and the Evenings of New Music. Recording by Ian Pace on Metier, MSV CD92022. Straight lines in broken times4 (1994) for 2 bass clarinets, tape (or bass clarinet + tape) (8′). Written for Roger Heaton and premiered by him on 23 November 1994 in St Paul’s Hall, Huddersfield as part of the Huddersfield Contemporary Music Festival; premiere of the version for two live bass clarinets by Harry Spaarnay and Andrew Uhren, Auckland 1999. Straight lines in broken times3 (1994) for solo cello (7′). Written for Friedrich Gauwerky and premiered by him in St Paul’s Hall, Huddersfield University on 12 December 1994. Dedicated to Richard Barrett. Recording by Anton Lukoszevieze on Metier MSV CD92059. 27 Fanfares (new heaven, new earth) (1994) for organ (13′). Written for Hans-Ola Ericsson and Huub ten Hacken and premiered by Huub ten Hacken in St. Janskathedral, ‘s-Heertogenbosch on 1 October 1994. Dedicated to the memory of John Cage. More things in the air than are visible (1993-4) for piano and tape (20′). Commissioned by Philip Mead with funds from the Yorkshire and Humberside Arts Board and premiered by him in a MediaMix concert, York University, on 11 March 1994. The title is a quotation from Ben Okri. Recording by Ian Pace on Metier, MSV CD92022. In the Key of H (1993/1998) for speaker, saxophone(s), tape (30′). Texts: Ian Duhig. A collaborative project with the poet Ian Duhig, commissioned for the 1994 Ilkley Literature Festival with funds from the Yorkshire and Humberside Arts Board and premiered by Ian Duhig, with Steve Cottrell (saxophones), on 11 March 1994. Recording of final section for saxophone quartet, ‘Complementary Air’, by Delta Saxophone Quartet on FMR CD104-C0502. Cylinders Barn, 1947 (1993/1999) for tape (6′). Originally commissioned by the BBC for the 1993 series of Radio 3’s ‘Between the Ears’ , devoted to ‘radiogenic’ work, and realised in the BBC Radiophonic Workshop. First broadcast, with MERZ-sonata, as ‘Three Constructions after Kurt Schwitters’, on BBC Radio 3 on 9 November 1993 . Nominated by the BBC for the 1995 Prix Italia. The revised works were mixed in the studios of the University of Huddersfield. A shortened version of the ‘First Construction’ was released on The All-Seeing Ear, Unknown Public UP009. Recording of Cylinders Barn, 1947 on Metier MSV CD92031. MERZ-sonata (1993/1998) for tape (11’30”). Originally commissioned by the BBC for the 1993 series of Radio 3’s ‘Between the Ears’ and realised in the BBC Radiophonic Workshop. First broadcast, with Cylinders Barn, 1947, as ‘Three Constructions after Kurt Schwitters’, on BBC Radio 3 on 9 November 1993 . Nominated by the BBC for the 1995 Prix Italia. The revised work was mixed in the studios of the University of Huddersfield. A shortened version of the ‘First Construction’ was released on The All-Seeing Ear, Unknown Public UP009. Recording of MERZ-sonata on Metier MSV CD92031. Trummermusik (1993) for mezzo soprano, hurdy-gurdy (13′). Written for Sara Stowe and Matthew Spring and premiered by them in Bradford Cathedral on 30 June 1993 as part of the Bradford Festival. Striking Out (1993) for solo viola (5′). Written for Andrew Toovey’s ‘International Viola Book’ project and premiered by John Metcalfe on 22 May 1993 as part of the 1993 Brighton Festival. lliK.relliK (1991-3) for solo piano (19′). Two works, lliK (8′) and relliK (11′), which may also be played separately. Written for Anthony de Mare and John Snijders; lliK was premiered by John Snijders in Madrid in April 1992 and relliK by him in the Zaal de Unie, Rotterdam on 21 April 1994. The title is ‘Killer.Kill’ backwards, a reference to its dedicatee’s nickname. Dedicated to Jerry Lee Lewis. Recording by Ian Pace on NMC CO66. Recorded by John Snijders on HatHut (for release in 2006). Block (1992) for prepared piano (4′). A response to the ‘Block Beuys’ in the Hessisches Landesmuseum, Darmstadt; premiered by Kate Ryder in the Lawrence Batley Centre for the Visual Arts, Bretton Hall, Yorkshire on 3 October 1993. Recording by Ian Pace on Metier, MSV CD92031. clarinet quintet (1992) for clarinet, 2 violins, viola, cello (13′). Commissioned by Ronald Woodley with funds from the Holst Foundation and premiered by him with the Adriano Quartet in the King’s Hall, Newcastle University on 20 January 1994. Recording by the Roger Heaton Group on Metier, CD92082. You, Us, Me (Habañera) (1992) for solo piano (4′). Written for John Snijders’ Carmen project and premiered by John Snijders in the Zaal de Unie, Rotterdam on 21 April 1994. The title is a quotation from Catherine Clements’ book Opera, or the undoing of women.. Recording by Ian Pace on Metier, MSV CD92031. Straight lines in broken times2 (1992) for clarinet, violin, piano (11′). Written for the Heaton-Balanescu-Pruslin Trio and premiered by them on July 21 1992 in the Aula, Georg Büchner Schule, Darmstadt as part of the Darmstadt Ferienkurse. Dedicated to Richard Rijnvos. Recording by Opera Aperta and by the Ives Ensemble on Metier MSV CD92081. I Sing for the Muses and Myself (1991) for piano (+ voice, ad lib.) (3′). Text: Ian Hamilton Finlay. Written as a tribute to Ian Hamilton Finlay and published in ‘A Cajun Chapbook’, a double issue (nos. 33/34) of the New Arcadian Journal (1992), pp.104-7. Recorded by the composer on the companion cassette, ‘A Cajun Musical Box’. Recording by Ian Pace on Metier, MSV CD92031. Louisiana (1991) for voice and piano (12′). Texts: (after) Kurt Schwitters in the composer’s English translations. 11 songs which may also be performed separately, of which the sixth, ‘Worthless Leather’, is for piano solo. 1. Valse; 2. Yearning; 3. Simile; 4. Ice Watch; 5. The Dreaming Country; 6. Worthless Leather; 7. The Critic; 8. Book-keeping for Small Businessmen; 9. Going Gone; 10. Reconstruction; 11. Hands Premiered by Marius van Altena (tenor) and Maarten Jense (piano) in the Museum het Kruithuis, ‘s-Hertogenbosch on 7 October 1992. Written as a collaborative project with the printmaker, Ian Colverson; each song fills a single manuscript page. Recording by Amanda Crawley and Ian Pace on Metier, MSV CD92031. Straight lines in broken times1 (1991) for organ (11′). Written for Huub ten Hacken and premiered by him in St Janskathedral, ‘s-Hertogenbosch on 9 August 1991. Heliotropes3 (1987/1990) for flute, oboe, clarinet, clarinet/bass clarinet, bassoon, horn (16′). Commissioned by the New MacNaghten Concerts with funds from Greater London Arts; premiered by members of the Haffner Wind Ensemble, appearing as The Composers’ Ensemble (dir. Stefan Asbury), in Blackheath Concert Halls on 15 March 1991. The Science of Freedom (1990) for baroque flute, baroque violin, percussion, harpsichord, viola da gamba (20′). Commissioned by Elissa Poole for Les Coucous Bénévoles with funds from the Arts Council of Great Britain and premiered by them in the Music Gallery, Toronto on 15 December 1990. Recording for Metier with Sirinu scheduled for future release. The title is a quotation from Joseph Beuys. stone.wind.rain.sun1 (1990) for 4 trombones (or trombone + tape) (9′). Written for Barrie Webb; premiered by the Netherlands Trombone Ensemble in de Ijsbreker, Amsterdam on 31 May 1992.
stone.wind.rain.sun4 (1989) for two clarinets (10′). Written for London New Music and premiered by Alan Hacker and Lesley Schatzberger on 1 February 1990 in the Purcell Room, London. Recorded by Roger Heaton for Clarinet Classics, CC0009. Leap like the heart (1989) for bass clarinet, trumpet, piano, percussion (2 players), double bass (18′). Commissioned by Arraymusic with funds from the Arts Council of Great Britain and premiered by them in the Du Maurier Theatre, Toronto on 26 September 1989. Dedicated to Arraymusic. The title is a misquotation from Isaiah (chapter 35, verse vi), ‘Then shall the lame man leap as an hart’. stone.wind.rain.sun3 (1989) amplified alto flute (8′). Written for Laura Chislett and premiered by her on 27 September 1989 in the British Centre, Berlin. stone.wind.rain.sun2 (1989) for saxophone quartet (SATBar) (10′). Commissioned by the Delta Saxophone Quartet with funds from Yorkshire Arts and premiered by them on 21 September 1990 in Bradford Cathedral as part of the Bradford Festival. Foreplay (1988-9) for flute/piccolo, oboe, percussion, piano, cello (8′). Written for Ensemble Expose; premiered by Ensemble Forum Neue Musik Berlin (dir. Peter Ablinger) on 17 July 1990 in the Orangerie, Darmstadt as part of the Darmstadt Ferienkurse. A-N-N-A Blossom-time (1987/8) for voice and piano (22′). Texts: the composer’s translations from the original German of Kurt Schwitters. Written for Amanda Crawley during the composer’s DAAD Berlin Kunstlerprogramm residency; six songs were premiered on 4 December 1987 in the British Centre, Berlin by Crawley and Fox. Recording by Amanda Crawley and Ian Pace on Metier, MSV CD92031. There are nine songs, which may also be performed separately. More Light (1987/8) for solo piano (20′). Commissioned by Philip Mead and premiered by him in the Gulbenkian Theatre, Newcastle on 28 July 1988 as part of Electric Music 3. The title is taken from an essay by Morton Feldman. Recording by Ian Pace on Metier, MSV CD92022. Ci-Gît (1987) for mezzo soprano, bass clarinet, prepared piano (+ alto flute, viola, cello, ad lib.) (16′). Commissioned by the Aquarius Ensemble (Sweden). The trio version was premiered by Amanda Crawley, Roger Heaton and the composer on 1987 in the Arts Centre, York. The title and text are taken from Antonin Artaud. Heliotropes7 (1989) for 2 clarinets, vibraphone (2 players) (4′). Premiered by Harmonie Band on 22 April 1986 in Maryport School, Cumbria. Heliotropes4 (1986) for solo horn (8′). Premiered in a version for solo soprano by Amanda Crawley at the British Centre, Berlin on 4 December 1987. A Kind of Prayer (1986) for two pianos (35′). Premiered by two pianists in the 1987 Insel Musik (Berlin) series; the first representative performance was given by Hildegard Kleeb and Jacques Demierre in the Cour de l’Hotel de Ville, Geneva on 21 July 1988 as part of the ‘Made in the USA’ festival. Heliotropes2 (1986) for trumpet, trombone, harp, vibraphone, double bass (9′). Heliotropes1 (1985-6) for 2 violins (10′). The first part of a projected cycle of seven works, originally intended for Ensemble Köln. 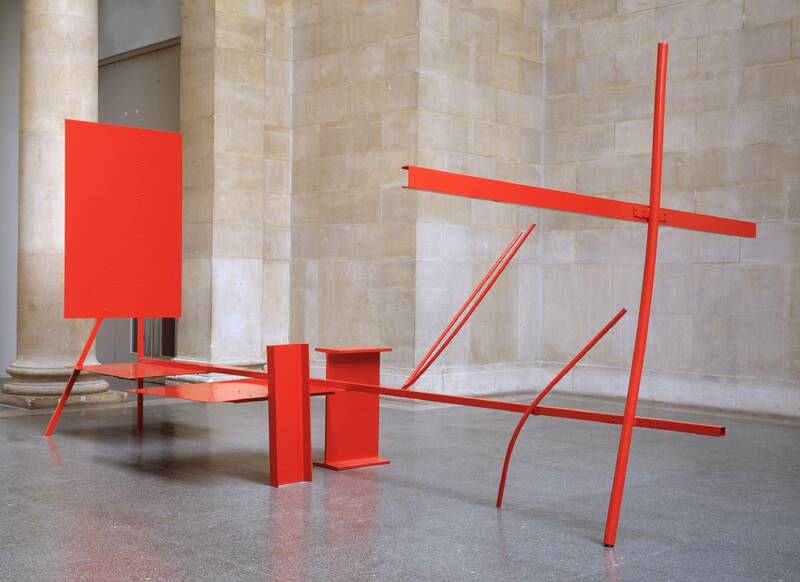 The cycle was completed in 1990 but consists of just six works; the ‘missing’ work would have brought together the fifteen instruments used in the rest of the cycle. Dead Fingers Talk (1985) for solo percussionist (14′). Written for Martin Allen; premiered by Nachiko Maekane on 8 November 1987 in the Crocker Art Museum, Sacramento, California. The title is a quotation from William Burroughs. The Missouri Harmony (1985) for organ (18′). Written for Huub ten Hacken and premiered by him on 28 August 1985 in St Janskathedral, ‘s-Hertogenbosch. Recording by EXAUDI on NMC D114. auf dem Zweig (1984) for piccolo, glockenspiel, mandolin (10′). Written for Aldo Brizzi and the Antidogma Ensemble; premiered by the Antidogma Ensemble (dir. Robert HP Platz) in Turin on 2 October 1985. The title is taken from a drawing by Paul Klee. …or just after (1984) for solo harp (6′). Written for Gabriele Emde; premiered by Frances Kelly on 11 May 1985 in a Soundpool concert in St John’s College Chapel, York The title is taken from Wallace Stevens’ ‘Thirteen Ways of Looking at a Blackbird’. …or just after (1984) for solo clarinet (or bass clarinet) (6′). Written for Roger Heaton and premiered by him in the Feedback Studio, Köln on 3 June 1985. It was between works by Dench and Dillon; “Chris… between Scylla and Charibdis”, wrote Walter Zimmermann on my programme. Broadway Boogie (1984) for 3 cors anglaises (or cor anglais + tape) (9′). Written for Nora Post and premiered by her on 1984 in the Aula, Georg BŸchner Schule, Darmstadt as part of the Darmstadt Ferienkurse. The title is taken from a painting by Mondrian. Winds of Heaven (1984) for amplified tenor recorder and 12 second delay (12′). Two movements which may be performed separately; delay is used only in the first. Commissioned by Peter Hannan with funds from the Arts Council of Great Britain and premiered by him in the Almeida Theatre, London on 1 July 1984 as part of the Almeida Festival. Recorded by Peter Hannan on SRI Classics (currently available from Artifact Records, Toronto). Threnos (1983) for amplified male voice (7′). Written for John Potter and premiered by him on 18 January 1984 at the Midlands Arts Group, Nottingham. Etwas Lebhaft (1983) for flute/alto flute, oboe, clarinet, horn, trumpet, trombone, piano, violin, viola (16′). Commissioned by Odaline de la Martinez with funds from the Arts Council of Great Britain and premiered by Lontano, under her direction, in the Purcell Room, London on 2 November 1983. Dedicated to the memory of Anton Webern. Missa est (1983) for counter-tenor (or mezzo-soprano), tenor, 4 viols, rebec, recorder, portative organ, bells (22′). Commissioned by the Landini Consort with funds from Yorkshire Arts and premiered by them on July 14 1983 in the Chapter House of York Minster as part of the York Early Music Festival. Contraflow (1983) for amplified bass flute (7′). Written for Nancy Ruffer and premiered by her in a Soundpool concert in the Chapel of St John’s College, York on 13 May 1983. Reeling (1983) for clarinet and hi-hat cymbal (8′). Written for Roger Heaton and premiered by him with Nigel Shipway (percussion) on 28 April 1983 in the Purcell Room, London. Dedicated to Roger Heaton. Recirculation (1981-2) for bass trombone and tape (12′). Written for Barrie Webb and premiered by him in the Recital Hall, Huddersfield Polytechnic on 29 November 1982 as part of the Huddersfield Contemporary Music Festival. Bewegung (1981) for 3 bamboo pipes (music-theatre) (10′). Premiered by Peter Stacey, Amanda Crawley and the composer in a MediaMix concert in the Lyons Concert Hall, York University on 20 May 1981. Alleluia (1981/1997) for 5 male voices (ATTBB) (4′). Written for Quodlibet and premiered by them in Gloucester Cathedral on 5 May 1982: the revised version was premiered by the Orlando Consort in the Lecture Theatre of the Victoria and Albert Museum on 18 August 1997 as part of the 1997 BBC Promenade Concerts. darkly (1981) for 4 performers playing non-instruments and wine glasses (music-theatre) (11′). Written for students on the Performing Arts degree at Ilkley College and premiered by them in the College Hall, Ilkley on 10 February 1982. Dedicated to Mauricio Kagel ‘zum seinem funfzigsten Geburtstag’. L (1980) for 4 male voices (ATTB) (10′). Written for Quodlibet and premiered by them in St Margaret’s Church, Ilkley on 20 May 1980. DaNCE (1980) for alto flute, clarinet, viola, cello (18′). 12 movements which may be performed complete or in shorter versions consisting of 6, 7 or 9 movements. Commissioned by the ICA (London) and premiered by Gemini in a MusICA concert on 22 February 1981. Dedicated to the memory of Igor Stravinsky. Recorded by Yorkshire Arts for the promotional cassette ‘New Music from the North’. American Choruses (1979-81) for 16+ voices (SATB) and 2 electric organs (c.40′). Texts: Allen Ginsberg. 4 movements which may also be performed separately. First complete performance: Soundpool Singers, Chapel of St John’s College, York. Dedicated to Wilfrid Mellers. Recording by EXAUDI on NMC D114. Serenade for blue guitar (1980) for solo guitar (c.12′). Written for Paul Carroll and premiered by him in the 1980 York Festival. Magnification (1978-80) for female voice and tape (8-12′). Written for Amanda Crawley and premiered by her in the church of St Michael-le-Belfrey, York on 25 October 1980. The text is based on the Magnificat. Second Eight (1978-80/1982) for solo piano (8’30”). Written as the final part of The Piano Catalogue, a music-theatre work (subsequently withdrawn); premiered by Christopher Norton in a MediaMix concert at York University. Recording by Ian Pace on Metier, MSV CD92031.